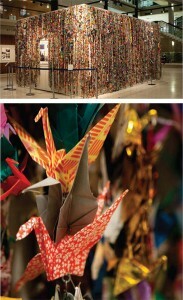 Student and community volunteers strung the cranes together for the exhibit Struggle, Hope, and New Life. More than 130,000 multicolored origami cranes cascaded into the Harris Fine Arts Center atrium in February, each crane symbolizing a Japanese-American citizen interned in camps in the wake of Japan’s attack on Pearl Harbor. Student and community volunteers strung the cranes together for the exhibit Struggle, Hope, and New Life. Along with the cranes, the exhibit featured photographs by BYU faculty and paintings by Japanese-Americans who were imprisoned in the Topaz Internment Camp near Delta, Utah. The exhibit opened in conjunction with the BYU Young Company’s production of A Thousand Cranes, a play about Sadako Sasaki, a 12-year-old Japanese girl who believed that if she could fold 1,000 paper cranes she would be cured of her leukemia caused by the Hiroshima bombing.